With more than 30 years of experience in the process of thermal treatment of liquid foods, REDA offers a range of specific flash pasteurizers designed for special applications (eg. soy milk, rice milk, baby foods, beverages, isotonic drinks, tea, natural extracts, essential oils, liquid eggs, honey, etc.). 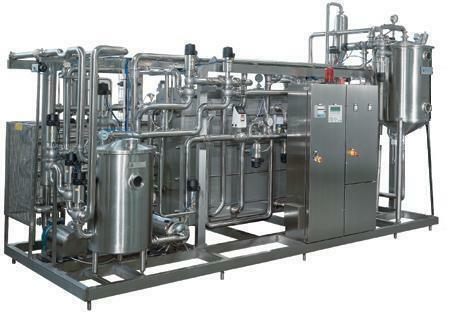 These systems are entirely made of stainless steel and can use plate or tubular heat exchangers, with variable time and temperature of pasteurization depending on product to be processed and project specifications. We always use heat recovery system (through product /product in countercurrent or by auxiliary circuit) to reduce and optimize energy consumptions. Flash pasteurizers can be semi-automatic or fully automated by electric-control panel with PLC. Production range may varies from 1000 to 50,000 liters/hour. Like all pasteurizers made by REDA, these equipments are designed on a self-supporting skid and pre-assembled, pre-tested and manufactured for an easy installation on place thanks to “Plug-and-Play” philosophy.